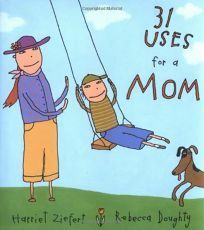 Harriet Ziefert enumerates all the things that make moms great in 31 Uses for a Mom, illus. by Rebecca Doughty, a companion to 39 Uses for a Friend. ""Clock"" leads the list, and Doughty depicts a hands-on-hips mother standing at the open door as the school bus pulls up outside. Other uses include chauffeur, hairstylist and last, but not least, friend. Doughty's scribbly black-line drawings with a watercolor wash exude a playful, childlike charm.